Max Mikulak - neuroblastoma angel: Lemonade! Get your ice cold lemonade! Sure. So Hannah and her friend Kendra got everything they needed to stet-up a stand on our corner and headed out. Their first customer gave them $5 for two cups after learning that they were fund raising for kids charities. Kendra's family raises money for various childrens charities, and Hannah chose MROF. I told them they could do whatever they wanted, even make money for themselves. "No, we'll donate!" Nicky joined in the fun as did another girlfriend, Jenna. One hour later we packed up what was left of the supplies (I had to replenish the lemonade two times!) and went home to find that they had made $142. Wow!!! What a great profit for an hour's worth of work! Great job, girls! You've set such a great example! What can I say except I AM SO PROUD OF YOU GIRLS! WOWEE! Way to go girls! You're awesome! Jacob used to do a lot of lemonade stands on 82nd and Broadway. He found that bringing out his wheelchair and baring his bald head produced a significant bounce in revenues when raising $$ for kids charities. I will be thinking about Max and all of you tomorrow. Over here it's past midnight, which makes it the 31st. 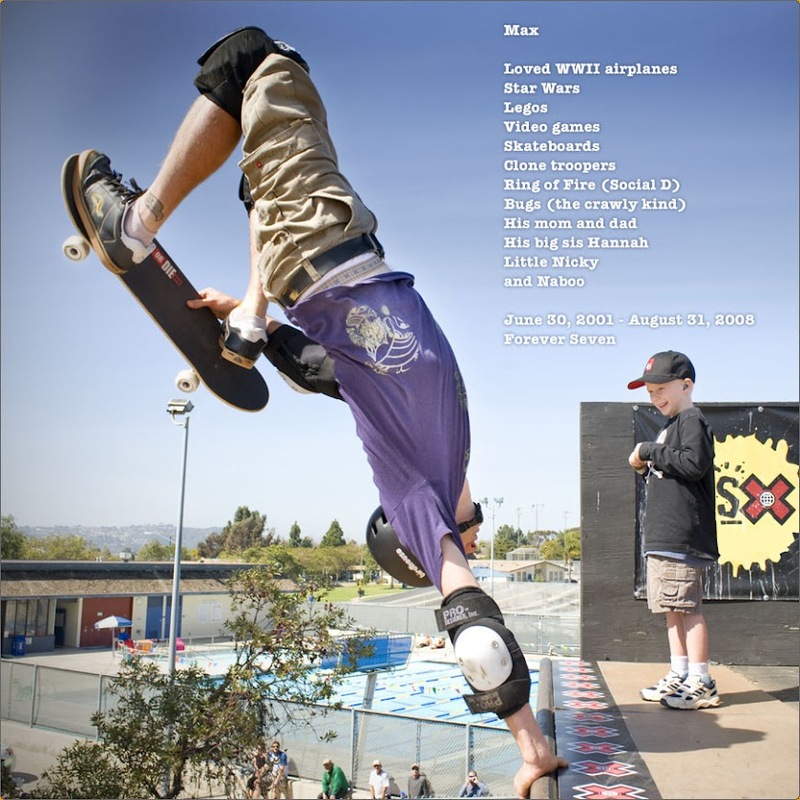 Gosh, I miss you Max. I love listening to you describe your planes on your Dad's videos, and I like to watch you and your big sis Hannah tearing up the concert floor doing "Ring of Fire". My own big sis died on the 29th, but that was years ago. She was really, really sick, and she was tired of fighting, too, I think. I don't know for sure. Max, I saw a biplane today that was black and white and had these flames painted all over the sides. I know you were there. Miss you. Remember how Naboo was following you when you were eating your popsicle? And you said, "he's following me Mom!" and then you said, "he also likes the play structure. Pretty much." I remember those "Pretty much"es of yours, too. Oh you would've loved that plane today, but then again, maybe you already saw it from up in Heaven.